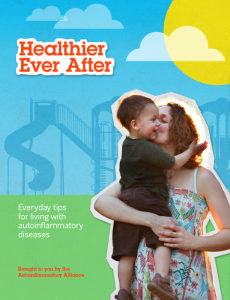 We are very excited to share our newest publication, the “Healthier Ever After” book to help families with young children thrive and cope with frequent (and often very painful) injectable medications to help treat autoinflammatory diseases. It was written by the Autoinflammatory Alliance board, which includes a pediatric RN, an LPN, a kindergarten teacher, and a professional writer. This book was developed by our board, thanks to an unrestricted educational grant from Sobi through The Cement Bloc, that also designed and produced the book for us. We are so thankful for this grant from Sobi, and for all the hard work by the team at The Cement Bloc to create this beautiful book with us. Suggestions from parents of children with autoinflammatory diseases were also a big inspiration for some of the information in this book. 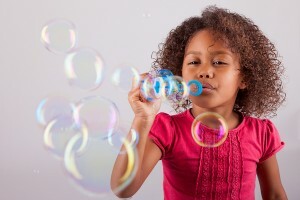 Topics include, how to help young children cope with their injections, traveling, distraction techniques, and more. 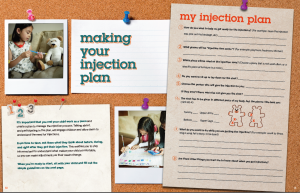 One of the key features of the book is a guide to discuss various things related to their injection, so you can help develop a custom injection plan for your child. 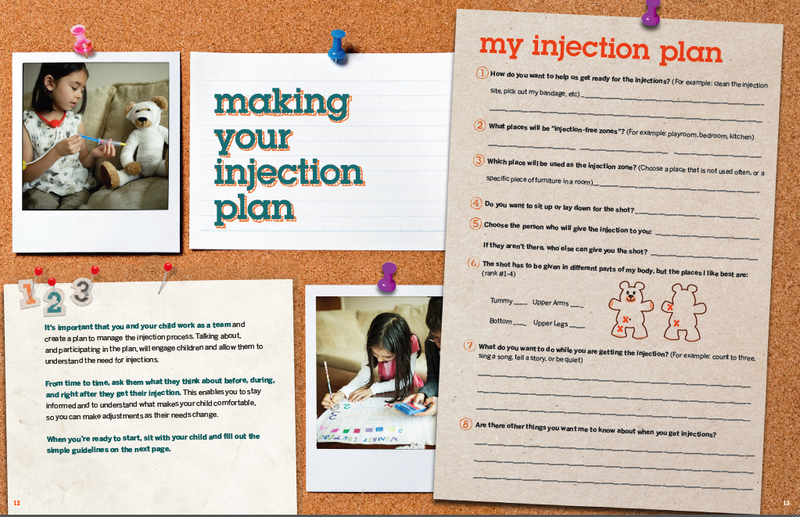 This plan will be used to fill in the page for promises (what the child will and will not do during the injection) and what awards they can earn for fulfilling these goals. 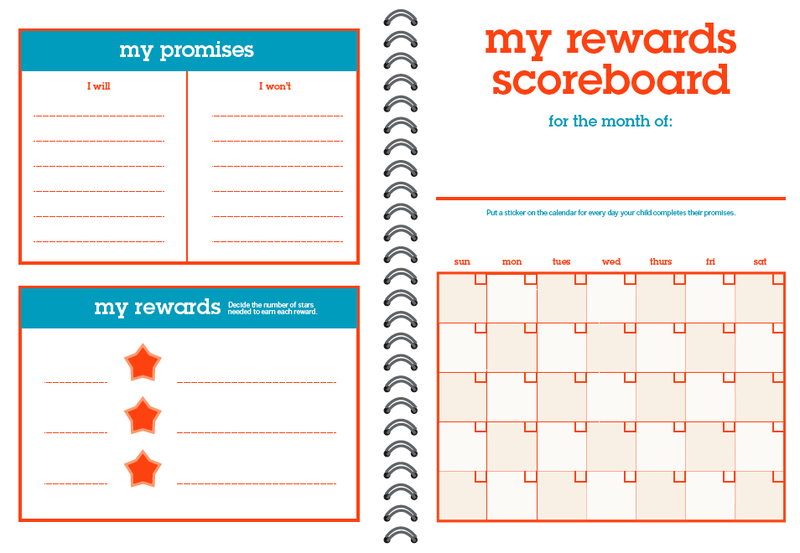 This page (shown below), and the page with the chart to track progress towards earning the rewards are made of dry-erase paper. A set of reusable, vinyl cling star stickers, and a dry erase pen come with the book. The printed book kit includes a reusable, dry erase chart and vinyl cling stickers to track your child’s progress. To order a copy, please do so through our Autoinflammatory Alliance online shop. This book costs a lot more to produce than the requested $5 for US orders (higher cost for outside the US). This fee covers packing, shipping, plus the vinyl cling stickers and pen that come with the book, that are all being paid for by our org. The educational grant to produce and print this first version was provided by Sobi, through The Cement Bloc, so our costs were greatly reduced. Note that you can download a copy for free anytime. If you are having challenges with being able to afford this nominal fee, and need a printed copy of this book, please email me at karen@autoinflammatory.org. 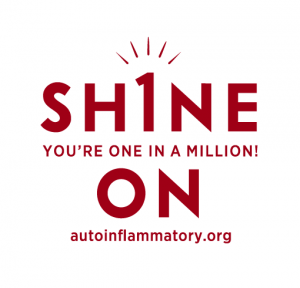 If you are willing to donate more to the Autoinflammatory Alliance, we would greatly appreciate it anytime, by mail, or online on our site. We are a tax exempt public charity in the US, so all donations are tax deductible. Your support will help us to do even more things for patients, and increase awareness about these diseases. We try to provide our other printed materials at no cost to people, but we do share a donation form when we send our materials, so anyone can give back, if they are able to do so. This book is our most expensive product that we have had produced, plus it costs more for shipping than our standard materials, so we are asking for a little help to cover the costs. Thank you. We hope that you like it! We would love to hear feedback on how this has helped your child and what we can do to improve it for future editions. For more injection tips read How to Reduce the Pain of a Kineret® (Anakinra) Injection and Distraction Techniques to Reduce Pain and Anxiety for Your Child When Giving an Injection. Click here for Tips and Resources for Patients on Biological Medications. 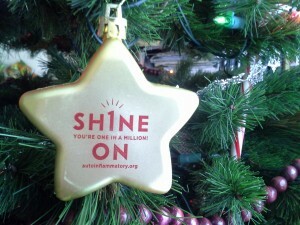 Limited Edition Star Ornament--Donate Today to Get One! Thank you! We really appreciate your kind words, and we want to also thank you for your efforts with your high-5-club. I will be in touch very soon. It is so inspiring to hear about all the things people are doing to try to make living with rare, and/or challenging diseases a bit better for children and families. 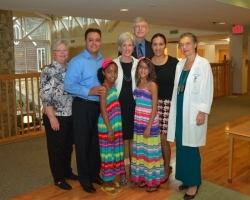 My granddaughter was recently diagnosed with NOMID and I happened on your website yesterday. THANK YOU! I Can’t wait to read every word. I am a retired registered nurse. My background is Pediatric Intensive Care and Pediatric Critical Care Air Transport. I never dreamed I would be explaining all the diagnostics to my own kids. 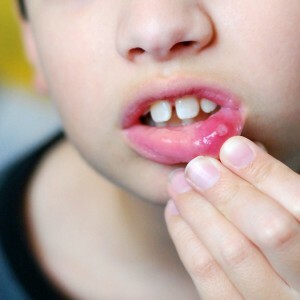 My son and his wife have been searching for answers to their daughter’s vague and perplexing symptoms for a year now. They are determined to do everything they can to help their beautiful baby girl. Our little darling just started on the Kineret injections last week and it’s already been a rollacoaster ride with a trip to the ED because of a fever. Even though we are in a major medical center city, with one of the largest children’s hospitals in the world, we are experiencing the lack of medical team coordination. We are confused, frustrated, and frightened. 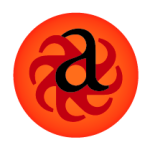 I am hope your site will help us navigate a little better. Thank again.